"For to us a child is born, to us a son is given; and the government shall be upon his shoulder, and his name shall be called Wonderful Counselor, Mighty God, Everlasting Father, Prince of Peace. Of the increase of his government and of peace there will be no end, on the throne of David and over his kingdom, to establish it and to uphold it with justice and with righteousness from this time forth and forevermore. The zeal of the Lord of hosts will do this." You know, this term "counselor" is the same idea where we get our term "lawyer." 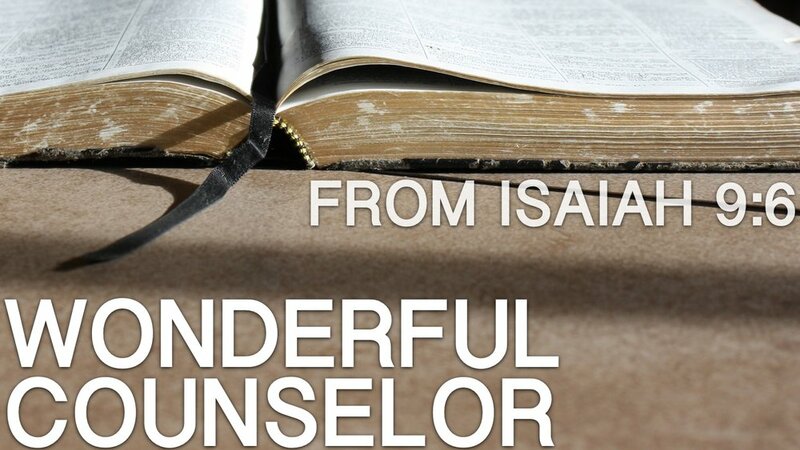 And, although we don't normally put the words "wonderful" and "lawyer" in the same sentance, we're told that the Messiah would be our "wonderful lawyer" in Isaiah 9:6. More specifically, that the Messiah would be our representation before God, the Father. That the Messiah would be our lawyer, our mediator, between us and God, our ultimate Judge. Job realized that, although he was a generally good person who lived uprightly and followed God to the best of his ability - that He was still not righteous enough to stand before God. He realizes that God is far above us and that there ahs to be a mediator. Someone who can meet God's expectations, yet is able to relate and minister to Job [and us]. The book of Ruth is also a wonderful picture of what is fullfilled for us in Jesus. In the book, Ruth needs what they called a "redeemer". She was a widow who's father-in-law and husband's land needed a nearby releative to buy-back and dedicate to the rest of her liniage rather than his own. When a nearby reletive would purchase this land, it would not be under their family tree, but under the widow and her chidren. It was very much a selfless act of love and sacrifice. And it HAD to be a close releative. In the book of Ruth, we see Boaz take on this role of a redeemer for Ruth - and in our own lives, we see Jesus do the same. We needed soemeone to "buy-back" our land. Who had enough "spiritual cash" to pay our debt - but they had to be a close relative. They had to be in the linage of Adam and Eve. Unfortuanlly, only God Himself has enough "cash" to buy us back from our sins. So, Jesus entered into the linage of Adam and Eve. Jesus was born as a man to live a perfect life and "save up enough cash" to buy us back. Now that Jesus has become our Wonderful Counselor (wonderful lawyer), we now have hope before our Judge. "You can waive all charges because I've already paid the just punishment against my client." because He paid our debt. Yet still manages to save us. However, like in any legal transaction, you and I (the client) have to agree to the terms. Or we can try to convinve the Judge that we deserve no punishment based on our own merrits. I'll give you a heads up though - we cannot convince a just judge that we are innocent, because we're not. "For the wages of sin is death..."
and their wages are death. and that's what we deserve. or you can receieve what Jesus earned and gifted to you. I suggest you listen to your Wonderful Lawyer. And accept all charges dropped. Because He's already paid the debt.